Safety hats from Discount Safety Gear - - Keep your head properly protected with discount safety gear featuring a collection of hard hats you can depend on to keep your noggin' safe and guarded while at work. Find industrial safety gear from custom hard hats that display your company logo to decal hard hats featuring cool designs including the NFL and NCAA logos. You'll find hard hats that are both functional and stylish with dozens of attractive styles and sturdy designs. Shop by brand with hats from Pyramex, Bollard, MSA and more of the leading brands! Safety glasses from Discount Safety Gear - - Shield your eyes from flying debris, dust, wind, foreign objects and dangerous chemical splashes with an eye opening selection of safety glasses available at the best prices on the internet! Designed with industrial and construction applications in mind, you can choose from a wide selection of styles of clear or tinted safety glasses from custom imprinted safety glasses to visitor glasses and more goggles and discount safety gear from Starlite, Crews, Jackson, Wiley X, AO Safety, Harley Davidson, North, Uvex and Orange County Chopper! Safety clothing from Discount Safety Gear - - Suit up for a tough day on the job with safety clothing for men and women from Discount Safety Gear. Find a high performance collection of discount safety gear and outerwear including high visibility clothing, reflective and reversible rain gear, ponchos and parkas, colorful safety vests and cooling vests, plus thermal clothing and base layers that will keep workers warm and comfortable on chilly winter days! You'll also find on-the-job work boots, standard safety equipment and more items that will offer you full body protection! Safety accessories from Discount Safety Gear - - There's no such thing as being too safe on a construction site or work site. If your job or home improvement project requires working outside or with hazardous materials, you need to stock up on safety accessories and standard safety equipment that will keep you guarded against any work-related accident. From safety masks to safety gloves, support belts, safety harnesses, knee pads, flashlights, lanterns and other accessories, you'll be sure to find the supplies that will keep every part of your body safe and sound! 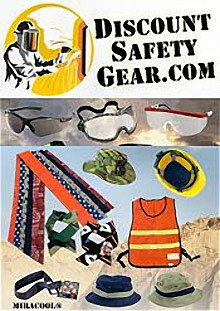 Shop for safety clothing and accessories from Discount Safety Gear for home jobs or for the workplace. You'll feel secure wearing the highest quality industrial safety gear, and even more secure with DSP's amazing discount prices.